The JDRF Promise Ball is our annual black-tie affair, filled with enviable silent and live auction packages, decadent dishes, luxurious surroundings and beautiful gowns. The Desert Southwest Chapter kicks off the year of formal philanthropic events. Many non-profits throughout the Valley hold these events to raise a lot of money towards their programs and missions. Each cause is important to someone impacted by it, but it is the duty of the foundation to ensure that the reason the event is held is not lost in the opportunity to be seen, but to make a difference. To understand something bigger than a night, to be a part of something that impacts these and future generations. JDRF galas have a programatic element that brings chills to those who witness it. It is called Fund A Cure. Fund A Cure is tailored like a live auction, but instead of bids to win a glamorous package, guests raise their bid cards to give a donation to type 1 diabetes research, with no trip, souvenir or piece of jewerly waiting for them when they leave. JDRF is one of the most efficient non-profits focused on funding medical science in the world, with over 80% of all expenditures going to cure, treat and prevent type 1 diabetes. 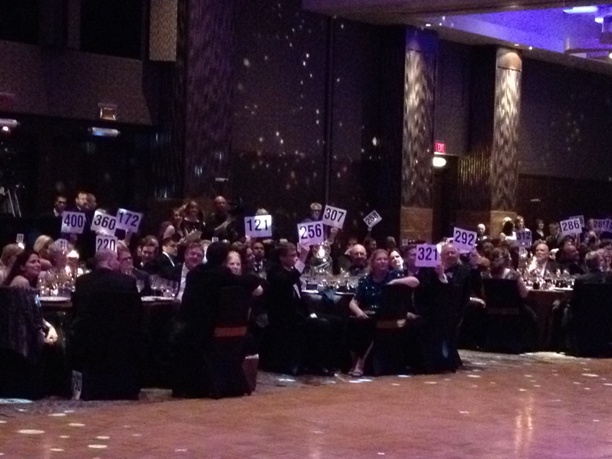 During Fund A Cure, 100% of the proceeds raised during the bidding go directly to research. For someone to raise their bid card and give hundreds even thousands of dollars in just seconds time, means they want to give towards a dream of those that know type 1 diabetes very well, those that take the step to advocate for research by telling their story. My guest post is from Scott Whyte, a member of the Desert Southwest Chapter Board of Directors and a close friend of mine. He is a loving husband, father of four and passionate advocate of type 1 diabetes research. He took the stage with his wife and four children and spoke from the heart. I am honored to publish his speech. “As a dad, I’ll share insights into our life of living with the disease. It’s a life of pain and worry, but also of thankfulness and hope. We have 15-20 blood tests per day, we count a lot of carbs, we weigh a lot of food, we have test kits and used test strips everywhere, and every 3 days, each child needs to change their pump infusion set. Much of this is managed on a big white board in our kitchen. Elise is continually doing “inventory management” to make sure we have enough supplies at home and at three different schools. More often than not, one kid is dealing with severe highs while another is battling continual lows. And I can’t tell you how many times we have had to drive to bring, or retrieve, a forgotten test kit. And yet, we feel very blessed –much of what JDRF has funded in the past has made our life simpler and healthier than it was just 30 years ago. We have supportive friends and family, we have amazing caregivers (one of whom, Dr. Chirag Kapadia, our endocrinologist, is here tonight), and we have faith that our children and their safety are in God’s hands. For Harrison, we are so thankful he has not been diagnosed. He’s a great student who is considering a profession in medical research – my hope is there won’t be much type 1 diabetes research for him 12 years from now. His risk of diagnosis is much higher than normal, and for Harrison, and for your children and grandchildren who are not diagnosed, we have hope that you, who are giving tonight, will fund promising prevention therapies and vaccines. Cameron has had troubles just within the last couple of weeks with lows. His bedtime blood sugars were between 30 and 70. We reminded him how dangerous the lows are (he knows that 20% of type 1 diabetics die from hypoglycemia). He was upset, and said he didn’t want to run high and suffer the consequences of foot amputations, blindness and kidney disease. That’s a tough conversation to have with a 12-year-old after dinner. It takes a lot of faith to let him go on overnights and trips without us. Cameron needs treatment and a cure. With Davis, I remember clearly, in the hospital, just a day or two out of the ICU when he was receiving new blood tests and new injections, he asked, “Will I get better?” I fought back the tears. I had to say, “No, right now there’s no cure, so you won’t get better.’ Davis needs treatment and a cure. Charlotte was just diagnosed this past October. She’s watched her brothers, and she immediately got into the routine. It broke our hearts when she walked in the kitchen and marked off her own space on the white board. We just got her a pink insulin pump, which she likes. We were getting up at midnight and 3am to check her blood sugar in order to calibrate the pump. We are thrilled that now we’re just getting up at midnight. Charlotte really doesn’t yet understand the long-term impacts of this disease – all she knows is that it really hurts to change her pump set. Charlotte needs treatment and a cure. Watching a Fund A Cure speech is watching a family unveil their fears, their hopes, their love for their children and each other. Bidding began at with a $60,000 commitment. Other levels were called out – $25,000, $10,000, $5,000, $2,500, $1,000, $500 – with guests raising their bid cards at each level and the auctioneer calling out bid numbers. As the bid cards became fewer, Harrison Whyte took the mic and thanked the guests for contributing to research to improve the lives of his younger brothers and sisters. The auctioneer then called for one last level, $100. Those who could give $100 to cure, treat and prevent type 1 diabetes were asked to raise their bid cards as the Whyte children, who would be directly impacted by the research the dollars would fund, called out the numbers. Fund A Cure raised over $100,000 for type 1 diabetes research in a matter of minutes. Everyone has a story, and the power to tell it, to take action for those we love and who love us. Better treatments, cures and prevention will come from the efforts of those that don’t sit and wait for it, but tell their story and ask others to take this mission as their own. Thank you again to Scott, Elise, Harrison, Cameron, Davis and Charlotte and those that donated towards a world free of type 1 diabetes. We will keep our promise until fulfilled. Needless to say, I drove past the university where the governor was speaking, called my boss and explained, and as I parked my car, I saw a helicopter land. I ran up to the roof, barely able to see because of the wind from the blades, not caring how much trouble I could be in for being up there. Sometimes you don’t realize what diabetes can do, until complications strike. Some complications progress over time, and sometimes they just hit and hit hard. Before that morning of spring 2006, I knew diabetes to be a constant frustrating formula of blood sugar checks, medication, food and insulin. I knew it meant upset stomachs and dizziness. I knew it could mean worse things, but until I saw him foaming at the mouth, unable to understand where he was, did I learn more about diabetes. I never hated anything so much in my life in that moment. I knew diabetes hung around to bother and threaten, but not to steal, and it did and does have the capacity to steal from me. Right in front of my eyes. I never felt so helpless. The rest of the day is a blur of phone calls, of waiting and family. When I couldn’t hover any more, I went to the chapel. I didn’t just sit in a chair and look at the stained glass and pray. I feel to my knees, grasped the chair, and begged God to save my dad. Not yet, not yet, not yet. Dad was saved by God and his team of cardiologists, medications and medical devices. Diabetes still lingers in his body, doing its damage like a messy unwanted guest, and I fear it will strike suddenly with another heart attack, a stroke or hypoglycemic event. Another opportunity to steal. It feels sudden, but diabetes is such a smart enemy, that it works constantly, and those that have it must also work constantly. Those that love those that have it watch constantly. Just watching and waiting for the next strike is no way to live, however. There are ways to strike back outside of watching what you eat, exercising, dosing as best you can, checking your blood sugar frequently, having consistent communication with a team of doctors, making numerous adjustments throughout the day and watching, watching, watching. All these are good practices, and will aid in preventing the next strike, but in a moment of helplessness, when you want to take it away more than anything in the world and can’t, you have to work towards a bigger picture. we striked back. And I don’t feel helpless. Do not ask that your kids live up to your expectations. I had to leave Camp Soaring Eagle‘s second JDRF weekend camp session for kids because of a severe infection. I was so upset. If I was a cartoon, I would be red with fume marks above my head. I refuse to stew on it, so let me get to the point of this post. Even through the blinding pain, I was still able to make observations in the short time that I was there. My new observations did not conflict with all my past observations from my job, but gave them depth. Our first weekend with Camp Soaring Eagle in September was with teens (ages 12-15), and this one was for the younger group (8-11). We knew that teens were hard to socialize, but that was overcome and the older kids really let themselves have a good time. For kids, we knew we would have more of a medical and behavioral challenge as the younger ones might have more difficulties with home sickness, knowing their bodies enough to convey needing assistance and higher highs and lower lows in a matter of minutes because they are still small. Food would be different, stress levels higher, activity levels different. Needless to say, we felt good about having one adult for every two kids including a lot of medical staff. Ever walked into a hospital wishing it was more fun and outdoors? Yeah, that was camp we had so many medical volunteers. 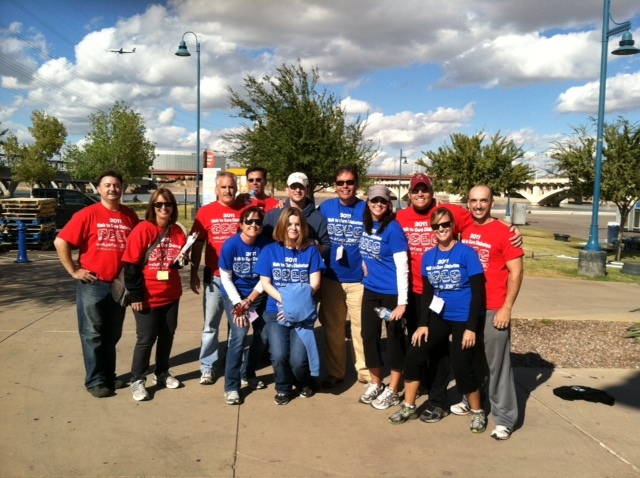 All of our volunteers were passionate and having a great time. Had to give a shout out. Volunteers, woo-hoo! Anyway, back to my observation. My first observation ever of a child with diabetes left me bug-eyed, because I thought (and still do) that type 1 diabetes was a cruel diagnosis. Needles, heavy responsibility and kids do not mix. I’ve met so many kids, all of them reigniting my faith in the human spirit. Such strength. BUT I always saw them with parents or guardians. Watching the younger kids away from home was really amazing. They are still kids. Running, jumping, laughing and living in a world fueled by imagination. Lots and lots of pure PLAY. Made me miss childhood. Adults have so many obligations, concerns and responsibilities that are just on us constantly. Kids are weightless…until. Diabetes must be managed, and what I observed happens in a blink of an eye, and if you are not paying attention you miss it. When it was time to check blood glucose (BG) levels, take insulin or correct a high or low, the kid vanished. The look in the eyes completely changed, posture changed, lines appeared on the face. Almost as if the thought process was, “Okay, gotta stop being a kid right now, think and take care of this.” They were calm, deliberate, and had discussions with medical staff. They dedicated their time and focus to this discussion. At such a young age, they knew that they had to take care of themselves. For a mind so young soaking in a constant flood of new information, with lots of other kids around, they stopped and applied what they knew for their health in order to resume play. One little guy blew me away. At evening snack, his BG was in target. He appreciated this BG, and wanted to keep it. His med staff volunteer talked to him about next steps and worked with him so he could make this decision. He engaged her and said, “One cookie and half of the milk.” He thought about it some more, then took his snack, sat down, ate one cookie and drank half of the milk. He came back to me, shook his milk cartoon and reported that it was about half. I confirmed his report and he watched to make sure our med staff was writing it down. He was in a kitchen full of kids and cookies. I have a hard time thinking straight when around cookies. Then, just like that, after the pricks, the application of knowledge and the adjustments, the kid comes back. Imagination rules once again. Giggles resume. I don’t know if parents get to see this too often. As the main manager of diabetes, parents might not get the full picture of what kids take on when Mom and Dad are not around. If you are a parent with a kid with diabetes, I hope you know that they when you are not there to take care of them, they really try to remember all the things they do with you to manage diabetes and how each decision impacts their bodies. They remember. They care to remember. Rebellion may come, and that is normal, but for such young people to understand that health, happiness and fun follow managing diabetes to the best of their ability is quite remarkable. Yes, indeed. “But the moment you turn a corner you see another straight stretch ahead and there comes some further challenge to your ambition.” ~Oliver Wendell Holmes, Jr.
For some time, I have been pondering my career and life path. Grateful to God for where I am, I also want to learn and apply. I want to go back to school, and have the freedom to deepen my strengths, use my talents and find new ones. For some time, I have felt my solid ground thinning, and I feel time slipping through my fingers, and the thought of staying still has become unsettling, as if I am on thin, melting ice, and I will fall through if I don’t move in a direction, any direction. Today marked my 12th Walk to Cure Diabetes working with JDRF. I know its not politically correct to say “JDRF Families.” Because households and individuals can contribute to many different organizations. Well, too bad, you work with me in this mission, and you become part of my family. Deal. Today, I saw the families I have met with for the past two years and missed my families in New Mexico. Thinking about all the families I have connected with as part of the diabetes online community, all wearing blue or telling their story, or sharing experiences today, too. The Walk is a year long program. I think that is lost on a lot of people. Walk Day is a labor intensive celebration of fundraising efforts from a year of fundraising. It was cold this morning. And wet. Still, after dust storms and pouring rain last night shadowing doubt that the event would take place, so many people attend this Walk, that we cannot count them all. We estimate around 20,000. I once again was able to see passionate volunteers braving cold, slush and fatigue all the while smiling and asking for more duct tape. I saw families, some veteran, some new to the Walk, some new to diabetes. And usually spotted here and there, but now in a small group, I saw adults with type 1 and their loved ones walking together as part of our JDRF Young Leadership Committee, Generation Cure. Lots of hugs, lots of smiles, lots of laughing and checking in. My colleagues and I feel every setback deeply, but even when the task seems Sisyphean we can make each other laugh. What a great group to drag hundreds of thousands of ever appearing lawn chairs with, to celebrate check donations with and spend 4:30am in freezing cold with. In the little things and in the big things, we know we are fortunate to work in a mission-focused organization that has an end goal to reach. We are a family, and we watch out for each other. Professional to the core, our loyalty to each other and the mission is not lost on us. JDRF will never lose focus on what the Walk means. It means cure, it means no more Walks. At the same time, standing still will mean never finding it, and in an effort to better educate the public, our Walkers, what their investment means, JDRF is on the move. We have a new logo, a new tag. But it is more than just marketing. It conveys that for the past 40 years JDRF has invested in research breakthroughs that have added to our understanding of a very complex autoimmune disease and funded research that has led to treatments that have made those with type 1 more safe. In the past few years JDRF has fought to bring new technologies to clinical trials to ensure those at the Walk today will see a cure. JDRF looks ahead to the thousands every year not at today’s Walk, yet to be diagnosed, by funding research in prevention to keep them away from a D-Day. JDRF placed a powerful ad urging the FDA to provide clear pathways to move a closed-loop artificial pancreas to market this past week, citing studies that have reported the incidence of death from hypoglycemia to be between 2% and 10% of the type 1 population, roughly 1 in 20. I, for one, don’t like reading about SUDEP (sudden unexplained death in epilepsy), and definitely won’t be sending my mom articles on it so she can calculate my risk (age and type – I’m more at risk, although it is a rare complication). Even taking care of other health conditions or not getting enough sleep to me means heightened risk. The week before Walk I was plagued with incapacitating migraines after a much needed hormone injection. Hormones can cause this anyway, but a sudden increase or decrease in hormone can also mean seizure and for me, waves of hormone sent me into a spiral of uncontrollable tonic clonic seizures three years ago. So, the pain and the fact that I woke up Thursday morning with a bitten tongue meant I was on serious edge. But being alert will do nothing for me. Only finding the causes of SUDEP, of generalized epilepsy and getting me the right dosage of the best new meds can keep me safe from the complications of epilepsy. For those living with type 1 diabetes, either they themselves have it or they have a loved one with it, this incidence of death is either an unwelcome reminder or shock, but it serves the purpose that we cannot stand still. We must keep pushing, and JDRF isn’t just organizing large community Walks for the social support it brings, but the organization is fighting with its Walkers, its volunteers and its advocates. Together, we fight for better until the fight is over, and type 1 diabetes has been defeated by the research we fund. We fight to save lives now. 1 in 20 is not acceptable, and should not be acceptable when there is work to be done. It’s a tough number, but we are tough, we are stronger in large numbers and above all that, our greatest strength is that we are more than numbers. We are approaching another National Diabetes Awareness Month (November) and in that month another World Diabetes Day (November 14th). During this time, the diabetes community goes blue, reaches out to other families living with diabetes, shares their stories, and creates awareness of diabetes, the types, the symptoms and its real impact. So many hear “diabetes” and believe it is caused by fast food and candy, can be managed with Splenda and exercise, and those with any type of diabetes battle this perception daily and use every opportunity in the month of November to get the word out. For the over five years I’ve been working with JDRF I’ve been on the outside looking in, as I myself do not have type 1 diabetes or a child or spouse with it. I’m up to my ears in books and papers, but I can only know about type 1, not life with it, unless I one day am given that diagnosis. So, I’m way passed the perception that diabetes in Snicker-induced but not even close to understanding what it is to have diabetes. I not only wanted to continue my efforts in spreading awareness, but also wanted to become a bit more aware myself. It was recommended to me a few years ago by an acquaintance to try saline injections and the pump. As someone without diabetes, it said it gave him perspective. I thought it was a great idea, and there it lingered in the back of my mind. Then when I moved into my current position and turned myself back into a student, devouring as many books and studies in as short amount of time as possible all the while meeting more families and individuals living with type 1, it became strikingly apparent. While I learned the ratios, how to carb count and how to administer a bolus and correction, I had never had to do the math, just glance at it and appreciate it. I had never taken a shot outside of for the flu and vaccines, and never given myself one. 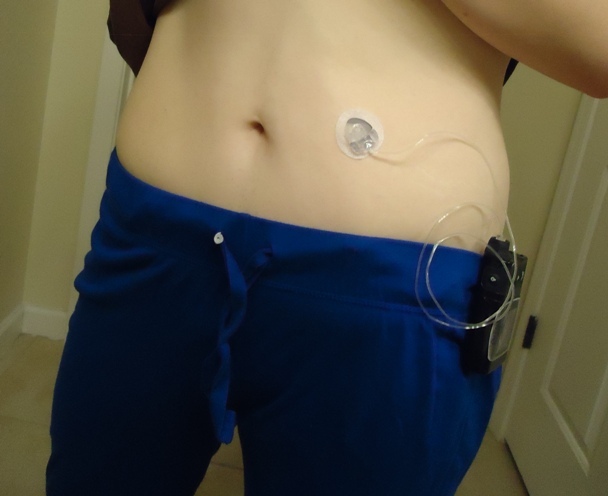 I knew of the pumps on the market and the ones destined to be as well as continuous glucose monitors (CGM), but never had one connected to me. In a group of people living each day with type 1 diabetes, I am the nerd, the bookworm. In a group of healthcare professionals treating people with diabetes every day, I am the research nerd, the research bookworm. I knew that just a bit of perspective might mean I learn something new, and being such an academic at heart, I cannot ignore that possibility. After a brief appointment, I asked my endocrinologist. Her eyes brightened, and she thought it was a great idea. Phew. I had a hard time asking. I told her I wanted to go through a “diagnosis” to learn the management decision making process a bit better. I felt guilty, because even though the electrical discharges in my brain have been abnormal, my immune system has not gone rogue, so there really is no decision I have to make that my body doesn’t already have covered. I have no factors that would lead to one. My beta cells compensate for highs and lows, and everything that can influence highs and lows, including my erratic exercise schedule and carbaholic ways. Who am I to ask for this trial that really pales in comparison to the real deal? But even though I knew I would be spared from shock of learning of the disease, the sick feeling of highs and lows, danger in short-term complications and fear and stress…even the simple act of testing more than 3 times a year and learning how it felt to be a pin cushion and learn more about my body and myself would be worth the embarrassment of asking to do it. I really thought about cancelling my diagnosis. I’m tired. I’m under a lot of work stress and I need to go back to Target because I forgot sandwich baggies. Also, my stomach hurts today. The last few months have been rough and uncertain. I really just don’t need another thing to do. But then again, no one can choose the day of their diagnosis, and if they could, they never would. So, I get in my car to meet with a certified diabetes educator (CDE). I made sure that I was not taking her time away from patients so she could treat my fake diabetes (from now on called “fakeabetes”). There were no patients at this time. I double checked. No patients waiting to be seen. People with actual diabetes (also called “realabetes”). I told her that I didn’t just want to jab myself more times a day than usual (I’m a clumsy person to begin with), but I also wanted her to create a carb ratio and insulin sensitivity factor (ISF) for me. I never ask for math. She made mine super easy. It’s not that I’m bad at math, it just takes more application for me. I was an “A” or “B” student in math and science, but after my second year of college when it was all fun and calculators, I became lazy. Nowadays, applying basic mathematical principles usually starts with a Google search. Because my blood glucose levels would stay in a normal range, my math would be infinitely easier, and I realize that, but still…math and I aren’t buddies. I love you right side of my brain, who treats me well. Curses to the left side. So, she started filling me in on my days with fakeabetes. How often I should test and when, what she tells newly diagnosed patients and what she doesn’t. I really wanted to learn how to apply what she was telling me as if I didn’t know of the disease, but couldn’t keep my mouth shut, so we talked about research, artificial pancreas, treatments and people we both knew and volunteer with. I take full blame for that. So for the first time, I left that office taking more resources than I had taken in. First realization – I’m going to need a bag for this, and then I’m going to need a bigger purse so the the little bag can fit in it. Finally, the only kitchen counter I have is now designated as my supply area (who needs toast? ), and I check my blood sugar because I want to eat. 78. Okay, that hurt. Testing only a few times a year means my fingers sting post-testing when I type or touch things or look at them. “If Train A left the station in Littletown, Arkansas at 8am heading west at 80mph, and Train B left the station in Smallcity Kansas at 10pm heading north at 769mph, where is Train C in the year 2045? I think that even though I am second guessing every little thing, I am using my experience to fill in the gaps, like timing my shot and when I should eat. So, clumsy me preps my first shot meant for myself. This takes a little finesse. I’m completely comfortable around needles, but that doesn’t mean I’m good with them. Shot goes in the thigh. Pinch and sting, then ow, ow…ow. Not really pleasant, and a bit sore. My “Lantus” will be my second shot. Somehow, I feel clumsier than with the first shot. Holding the vial and the syringe and drawing the saline is not a fluid process for me. It’s why I drop pens all the time. All…the…time. Nothing dropped! Shot goes in the stomach. Don’t even feel it. I am happy because I had no sting and no soreness, AND the needle didn’t end up in my eye. An actual possibility for me. Nighttime blood glucose check (BG) hurt worse than the shots. Couldn’t get blood and then did another fingerstick and blood everywhere. I don’t have my Dad’s fingertips of steel. Typing “w” and “s” is the worst. Ow. I am at 83. I feel somewhat successful even though I did nothing to achieve this BG after an all-natural probiotic frozen yogurt treat for dinner. If I had type 1, I would not feel comfortable going to sleep with this BG. I don’t want to eat anything. My all-natural probiotic frozen yogurt treat really filled me up. Luckily, JDRF has a new Adult Type 1 Toolkit (shameless plug!). There is information for diabetes in the workplace. Gotta tell my boss that I have fakeabetes. I think JDRF is one of the most perfect places to work for someone with diabetes. It’s understood. Fakeabetes, uh, not so much. “I can’t believe you’re taking on another thing,” she said. She’s right, as I’m managing a lot. I explained to her my reasons for doing it, and she understood and told me to keep her posted on how it goes. My director and colleagues are completely supportive, and I know in the coming days my coworkers and friends with diabetes are going to probably get a bit of a laugh of out me as I attempt to manage fakeabetes. Already, I’m not liking it. I didn’t expect to like it, but the time commitment is already becoming a pain, and all the little considerations that go along with it don’t mesh with a crazy busy life at work. I knew I needed a break, so I had planned a trip to visit my parents for the weekend. Fakeabetes was coming with me. Greet parents, and tell them I need to try to find saline. Ha. Hahaha. If you know where this is going, feel free to read on so you can laugh at me. First pharmacy doesn’t have saline vials. Go to Walgreens. First pharmacist doesn’t know what I’m talking about, pulls in second pharmacist. So I begin every request with, “Ha, okay, this is a long story…” Second pharmacist says, “This is going to sound really stupid, but you need a prescription for it, and it has to be special ordered unless some pharmacy has it already in stock.” I feel like I have bothered my CDE enough with the initial time she spent with me on this project, but I am willing to make that call if I can find a pharmacy that already has it in stock, and my parents are hungry, so I am running out of time. Call after call, lead after lead, and I am told by a hospital to try urgent care (seriously, this was after explaining the situation). I actually call urgent care, and after being handed off a couple of times (this is an unusual urgent request, I would think), I tell my story to a sweet guy who finds a number of a pharmacy for me. My parents are ordering food at this point. I call the pharmacy, and it is a fax line. My mother makes the observation that it would probably be easier to get heroine or meth than saline. I give up. I’m going to have to tea party it for the weekend, and no, I don’t mean take a far right conservative stance on managing fakeabetes, but pretending to draw saline as if I was holding the vial, like a little girl drinking imaginary tea. This actually works, even though I feel like an idiot. By the time I’m done checking my blood sugar, writing it down, “prepping” the shot and going to the bathroom to give it (Mom said not at the table, pffft), my parents are already half way done with their food. I don’t have high BGs to use my ISF, but Dad does. Having type 2 for over the past 20 years, Dad is too familiar with highs. So, I ask Dad to check his BG every time I do, so I can use his numbers. Considering that Dad went from checking on average 2-3 times a day to over 7 times a day, I’ve given him another reason to fret my visits. As a nagging daughter, I’ve laid off the diabetes cop role and he the epilepsy cop role for the past few years, but I’m still nosy about his management. It was actually fun to check our sugars together, except when I told him to down water for a high, and then we couldn’t get him to a bathroom quickly, so he was very uncomfortable as we tried to park. I felt bad about that one. Sorry Daddy. Every time we sat for a meal, Mom would preface for those at the table, “You know what she’s doing?” And then she would follow with, “I can’t believe kids have to do this every day.” It’s a lot to imagine a small child or teen dealing with this, but at 26 I’m not enjoying it very much, gotta say. I don’t know if being older makes a person better equipped to take it on. I am fairly set in my daily ways and like the flexibility to change my daily habits when I please. I loved my life without fakeabetes, just like I loved my life before epilepsy. Nothing hanging over you to take care of first. My first week of injections could have left me really ill or put me in the hospital if the saline had been insulin. I saline stacked twice, and giving myself a shot, I went through the process of prepping it, and didn’t realize until after I injected that I had given myself 30 units. My eyes bulged out of my head and my heart stopped. The syringe was still in my hand and I was frozen. I remember that feeling well, because I get the exact one when I forget my pills. Crap! I learned from these experiences that even if managing diabetes becomes more routine, it still takes your complete focus. It demands it. You have to stop everything your doing and focus on the task at hand. This is really difficult for a multitasker like me. In a week, BG checks were a lot easier (I was gettin’ good at it), and shots were easier and a little bit quicker. Still didn’t make me a fan, though. I was ready to stop the shots. Our Medtronic Diabetes Clinical Manager, Alison, worked to set up a time to put me on a pump trial. She recommended a Barnes & Noble, which was kismet because I needed to replace my copy of War and Peace. She went through all the steps with me. This was too easy, I thought. It’s an easy to use device, I knew, but it actually is easier for me, because I knew I would get to play with it, without measuring the consequences of every change in delivery and make more changes. And then adjust, and then measure, and then possibly make more adjustments. I was on the Mini Med Paradigm REAL-Time Revel 523 and using Mio infusion sets. Connecting to the pump was painless, and I didn’t even feel it at all. I just looked at her blankly for the next step to put it in. After I was ready to go, we sat and talked about research and technology and our jobs, so once again, I take full responsibility for that. My first bolus came with dinner, and I was so excited. It was so easy and accurate and took so much less time than the shots. All this I knew, but never experienced, so I was on cloud nine. So, after I bolused, and wanted to sit and relax and eat, I looked at the pump. It was going to be with me for dinner. I looked at it, as if to say, “Thank you for your medical magic, but I am so over you now.” I don’t like having something connected to me. I got thrills bolusing and playing with it, but then wanted it off immediately. Slowly, during the course of my four day trial, it felt a bit more normal having it on. I still wanted to take more showers just to disconnect from it. I was very proud of myself doing my first site change, but then thought, “Ah dammit, it’s back on me again.” That 3 minutes of heaven is over. Knowing lots of people on shots and their reasons and lots of people on pumps and their reasons, I’m starting to understand the emotions behind them. I hated having to take shots, the time it took, and all the saline stacking and miscalculations I made. You can’t deliver the an exact amount of insulin with shots. Pumps do seem like magic after that. It does all the thinking for me, I can deliver “insulin” over time as my food would would demand and it accounts for “insulin” already in my system, which I didn’t even do on a remedial level. It’s safer and more accurate, and if I want to snack on the way home from the grocery store, I can bolus in the store! But, with shots, I take a shot, done. I’m disconnected. It seems like the difference of what you want to do and should do, and every decision I have made so far, has been a battle between the two. What is difficult, is finding out what you should do and when you should do it, something I don’t have to face without the actual disease. After one week, 2 days with fakeabetes, I was getting really sick of it. I started thinking about the day when I would be done. The thought made me happy. I also was having nightmares. I would dream that I forgot to check my BG and something wrong was happening. The first few seconds after I would wake up, I thought I had diabetes, and first thought was to check my blood sugar. Then reality would flood back in. I have fakeabetes. The pump made me question my decisions. For instance, I found a new popcorn at Whole Foods. Popcorn is very addicting for me, and even though I thoroughly read nutrition labels, (especially the ingredients list) and I eat really healthy, I never carb counted until now. So, looking at the carb count on popcorn, I could actually imagine money being pumped out of me. Insulin is money, and even though I was attached to saline, I put the popcorn back. Denise came into my office to put me on the Ping. With her calm voice and slow instructive movements, I felt as if I was watching a professional tutorial, so I was really quiet and listened. My infusion set was the inset, so the same procedure as my first. I went through the menu options with Denise and we played with the remote. She took the pump across the hall and I administered a bolus. So cool! I can definitely see how remote bolusing is a great feature for parents of small children, but even me…the Ping clips really tight to my pants, so it is easier for me to check BGs and bolus with the remote than trying to unhook the pump (okay, I just outed myself on laziness on that one). After visiting our office, I was able to show Denise a bit more of what we do and we talked about programs and education, and I take full responsibility for that. It was so great to be back on a pump even after just that one shot. Coming into JDRF in 2006, I immediately began advocating for CGM. JDRF funded trials to prove efficacy of the devices and then made those trials visible. JDRF advocated for wider coverage of the devices, making them more available to patients today than just a few years ago. Now, as JDRF has invested in the artificial pancreas and we are strongly advocating to bring a closed-loop system to homes in the very near future, I was so excited to try CGM myself. I know a lot of people on CGM, and I have heard the cons and I have heard the benefits, and now I get to put one on, or er…in….or rather in and on….? Sierra came into my office. We both knew that CGM is meant for people with diabetes, to provide safety and a wealth of applicable knowledge. For me, I thought I would learn how to use the device, but that I would flat line, meaning I wouldn’t get alarms that I was too high or too low, and I wouldn’t be making proactive decisions from it. I didn’t sleep at all the first night. When setting my alarms with Sierra, she was surprised I wanted any alarms. Sure, I said! I do run low, so I thought 70 would be a good low threshold, and 120 my high. Omigod, it alarmed constantly. I did hear the vibrations, but the alarm was loud. So, when I actually did sleep, it was not good, because as you can imagine, having a new device slightly imbedded your body and it screaming at you does not for sweet dreams make. It was alarming me that I was in the 50s. Impossible, and now I was angry, so I got up and checked my BG at 1am. I was a little shaky, but I was half-asleep! I was in the low 60s. Huh. I never would have thought that. The screaming receiver that I despised for its sleep-interrupting lies just seconds ago, I now had a deep appreciation for. My body protects me when my BG levels are low, but if I had diabetes, that alarm could easily have saved me. And I was up and in the kitchen and not asleep completely unaware. When I had to wake up because morning had come I was exhausted. Also, I knew that night-time diabetes management and epilepsy do not mesh, but I really felt that weight and anxiety on me. Interrupted sleep and sleep deprivation is a common trigger for seizures. I forgot what day it was, but I knew that my BGs were climbing back into the 60s as the morning continued. CGM started to become my friend. It wasn’t on point, but the trends were correct. One night it alarmed me that I was 120 and rising. Hmmm…I’ll just check. After a fingerstick it said I was 160! I had to use an exclamation point, because I never had a BG reading that high…but I was also never prompted to check. After 20 days with fakeabetes, I’ve been accused of now having hysterical diabetes. I also had a new attachment to CGM, not wanting to give it back. I can only imagine the attachment that happens between someone with diabetes and this tool once they have had all this information pouring from them, whether its exact 100% of the time or not. I must confess, with the pumps and meters, I have over and over again listened (well, eavesdropped) on how it works, their respective features, the steps to take, etc. But all that information flew out of my brain because I wasn’t placing it on my body and pushing buttons. I remembered most of the information, to my credit, but I really had to treat everything as it was new. Sitting with Dino from Omnipod as he explained, I noticed that this was one of the first times I kept my mouth shut. Even though each step was incredibly easy, he really took his time and explaining how it worked, and I again appreciated it. After highly favoring my stomach for the past week, I went for the arm, so there the pod went. Filled with saline, I felt a slight flick on the back of my arm and looked at him questioningly. Good to go. By the time we were talking of the basic features, I was already playing with the PDM. Once he felt comfortable with my basic knowledge, I began talking about work, marketing and medical devices with his colleagues. I take full responsibility for that. I really thought it would bother me, to be honest. I thought it would feel like well, a small pod was attached to my arm. I could only feel it when I thought about it and touched it, or heard a “thunk” as I would cut corners and it would hit the doorway. That’s just a clumsy alarm feature that comes with all pumps. I got tangled in the seat belt with a tubed pump, so that was the alarm for that one. I had good fortune with the medical device trials. No kinking or malfunctions. The one I would choose? Ha, I’ll never tell. I shouldn’t tell, because fakeabetes is really easily managed in comparison. There is no comparison. The medical devices chosen by those living with diabetes should be chosen because that is the best option to go toe-to-toe against what their diabetes is trying to do to the body. The 18 days with fakeabetes did create another level of awareness. I didn’t expect to enjoy it thoroughly, but I did expect to enjoy the learning! I learned on a deeper level that diabetes is a total pain, filled with little pains and confusion. I could only suppose as much before, but I really hated fakeabetes. I really liked seeing the technology and watching it work, but it was no comparison to not having to have it. Flashback to the car ride back to the JDRF office after my first Kids Walk to Cure Diabetes assembly with my then boss, now colleague and one on my best friends. She has had diabetes since she was a small child, and I had just started working with JDRF. The students were beyond enthusiastic about finding a cure. They screamed and applauded. My friend contemplated what a world without diabetes would mean for her. It has been with her since childhood and her career is focused on defeating it once for all. All the care she takes in managing her diabetes, she thought, what would she do with her time? It is a lot of time to get back, not having to deal with this. When I took off the last of my devices, I felt like a dog just released from a bath. I wanted to dance and run around rapidly in circles. I was very happy and felt free. After just 18 days, I got to shake it off. My friend and coworker down the hall is feeling awful today because her diabetes is throwing her new punches. My friend across town is battling high blood sugars she can’t identify the source of. They can’t give their diabetes back, like I did. They can manage it, cherish times when they have it under their thumb, but they can’t give it back. Not yet. I’m not naive. I don’t think a cure will appear and be readily available tomorrow or next week. I know it will be a long and persistent fight. A fight to fund cure therapies, a fight to educate, a fight to create awareness. But for that day when they can give it back, it is most certainly a fight worth waging.